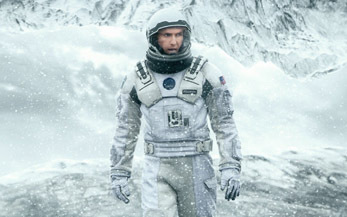 A project as vast, as ambitious and as bold as Interstellar is difficult to evaluate. By some week-in, week-out rubrics of recommendation, it’s an unlikely champion; it is unabashedly heady, grandiose and defiant in its faithfulness to an unconventional story. But while a certain amount of Twitter-age rabble will decry its twists and occasional pomposity, I’m confident that Interstellar will be regarded properly over time — as the finest piece of 21st-century filmmaking to date, and an all-time classic. Little was known about the content of Christopher Nolan’s labor of love prior to its release, but the effort to have it made spoke loudly. Consider a film like Inception, another sci-fi think-piece from the director; impressively rich, Inception was a film Nolan made in the spare time between chapters of his Batman franchise. Interstellar, by contrast, was a multi-handed labor of love more than 15 years in the making. So, by the arithmetic of it, if Inception was made on the side, what could Nolan do with his full attention? He could (and did) make a spacefaring epic of unparalleled ambition. Interstellar predicts an intellectual stagnation in Earth’s near future; whole fields of learning have faded away as misinformation and utilitarianism reign. Technology is a non-factor and blight reigns; crops are failing fast with no solution in sight. Cooper (Matthew McConaughey) is a widowed ex-astronaut now working (like most people) on a farm; after his daughter Murph (played at various points by Mackenzie Foy, Jessica Chastain and Ellen Burstyn) begins to receive cryptic messages from unseen hands, the pair follows a set of coordinates to an unmarked facility hiding the remnants of NASA.